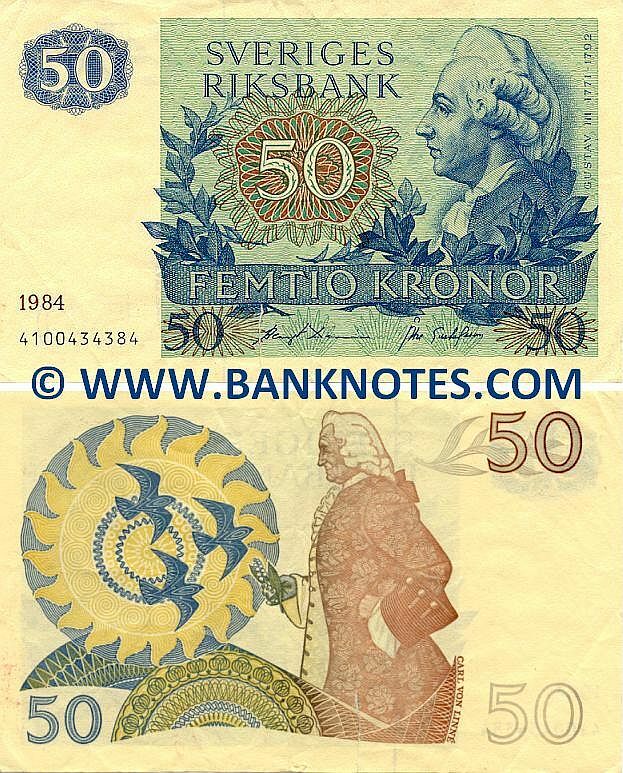 Sweden 50 Kronor 1965-1990 - Swedish Currency Bank Notes, European Paper Money, World Currency, Banknotes, Banknote, Bank-Notes, Coins & Currency. Currency Collector. Pictures of Money, Photos of Bank Notes, Currency Images, Currencies of the World. (1707 - 1778) standing in profile holding a Twinflower (Campanula serpyllifolia), later known as Linnaea borealis. 1982-1993); Åke Gustafsson (Unknown). Dominant colours: Blue, light green, yellow and chestnut brown. Security thread: Vertical, solid, narrow. Issuer: Sveriges Riksbank. First Date of Issue: 1965. Artist: Unknown. Legal tender: No. Date of withdrawal: 31 December 1998. Material: Cotton paper. Printer: Tumba Bruk. Texts: Sveriges Riksbank. Femtio Kronor. Fifty Kronor (Crowns). Gustav III 1771 - 1792.